Composing musician Paul Sills of the United Kingdom has a great New Age album dealing with the relevance of our universal perception of the world as it relates to celestial music. 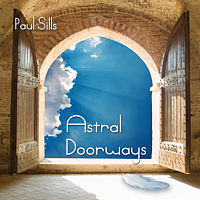 Astral Doorways was Paul’s creative first endeavor that explores the celestial and surreal side of music, where illusion plays a definitive role to permit passage beyond this proverbial threshold. His music seems to arrive at a deeper realm in how we experience synthesizer music. Paul’s second album Walking Across Heaven likewise explores our inner imagery in a meaningful way, creating a beautiful sanctuary of sound that arrives at a beautiful music experience. Both albums reflect a celestial or spiritual presence about them, easily fulfilling any dictionary definition of perception as it relates to music. Astral Doorways on the Medwyn Goodall Music label is a truly powerful album, symbolic of the outer boundaries in synthesized music and simply a must have release for those who love a memorable trek into the territory of unfamiliar sounds. There is no doubt that his fans own both albums, since I couldn’t imagine anyone possessing just one album without the second nearby within easy reach. Both albums are well crafted. The 12 tracks on Astral Doorways is the metaphorical portal where crossing the threshold of consciousness is achieved through his unique brand of orchestration. 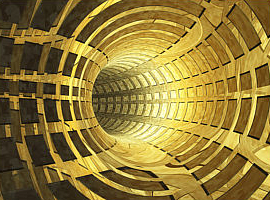 This melodic transformation is portrayed by an atmospheric blend of piano, flute, guitar, and choral vocals, where piano key strokes play a primary role in the melody decision making, and choral vocals point out the given steps for safe passage to discover what lies beyond the twilight zone in celestial music. Perception can be defined as, the conscious neurological process for interpreting sensory stimuli that is derived from intuition or present memory to help resolve or comprehend the present concept in a meaningful way. Like an optical illusion, the music of Paul Sills creates an ever changing phenomenon of sound where what you hear, may be contrary to what your present understanding is of what lies beyond the other side, by skillful layering of synthesized music. The song Pathway is a monumental first step, starting out with a rhythmic guitar pattern that charts the schematics and steady pace for your journey. The gentle piano melody then starts a graceful stride, reaching a point of calm that resemble secure steps taken along the winding path. Aglow is a pivotal song where key changes from ivory to ebony are the principal rule, changing mood and thought one keystroke at a time. Gently flowing and deep, peaceful transformation begins to take place during moments of lower octave piano melody, while string orchestra offers an insightful glimpse into the unknown territory ahead. Angelic Grace is a moving celestial song that gently rises above in tonal qualities. The piano melody is gently released from an earthly grasp, gently floating weightless towards the heavens. Synthesizer orchestration rises into rhythmic flow as strings bring forth what you have just heard into beautiful music upon your arrival into this sanctuary of sound. An musician interview with Paul Sills is just around the corner. Perhaps he will explain how his personal trademark sound with a powerful yet gentle approach leaves such a monumental impression on everyone. Sample or purchase music by Paul Sills at Amazon.com. Picture copyright Big Stock Photo.com – truelight.